Middle Eastern immigration to Mexico is one of the intriguing, untold stories in the history of both regions. In So Far from Allah, So Close to Mexico, Theresa Alfaro-Velcamp presents the fascinating findings of her extensive fieldwork in Mexico as well as in Lebanon and Syria, which included comprehensive data collection from more than 8,000 original immigration cards as well as studies of decades of legal publications and the collection of historiographies from descendents of Middle Eastern immigrants living in Mexico today. "Filling an important gap in our understanding of Mexican migration and identity is Theresa Alfaro-Velcamp’s new history of Middle Eastern migration to Mexico... a highly readable narrative that explores the rapid growth of Mexico’s Middle Eastern community. ... [Mexico] is not simply a Mestizo state mixing Spanish and indigenous traditions, rather as Alfaro-Velcamp shows, Mexico can only be understood as multiethnic." "In this innovative book, Theresa Alfaro-Velcamp examines Middle Eastern migrants in order to broaden our understanding of Mexico as a multicultural nation. ... She places them within larger transnational networks extending throughout the Mediterranean and North America, while also examining the changing relationship between United States and Mexican immigration policies. ... Alfaro-Velcamp effectively deploys multiple scales of analysis ... Alfaro-Velcamp shows that wealthy capitalists, most notably Telmex mogul Carlos Slim Helú, cultivated a distinct image as “foreign citizens,” while more modest migrants sought to blend into the mestizo majority. She provides a model for future studies of relations between migrant groups and local cultures. ... This book adds an important new chapter to our understanding of the modern construction of lo mexicano." "This book is a fascinating history and historical geography of Middle Eastern migrations. Through thorough archival research, personal interviews, and a compelling writing style, Alfaro-Velcamp weaves together a gripping narrative of a little-studied migrant community that has played a significant role in the historical geographies of Mexico and the United States, as well as of several South American countries. 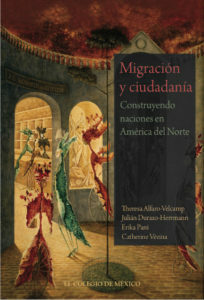 ... By situating the discussion of immigration in the context of Mexico in a time period of the emergence of a Mexican national ethos and a dynamic relationship with the United States, ... the book portrays the complexities of these spatial and social processes so often oversimplified in both scholarly and popular writings." "Theresa Alfaro-Velcamp makes a fascinating statement at the very beginning of her book: “there are many ways to be Mexican in the twentieth century.” ... A meticulous historian, Alfaro-Velcamp presents ... why Middle Eastern immigrants came to Mexico, where they settled, how many came, where they came from, how Mexicans responded to them, why some areas were more attractive to the immigrants than others and how they positioned themselves. ... So Far from Allah, So Close to Mexico masterly reveals Mexican multiculturalism." "Theresa Alfaro-Velcamp’s research offers the reader not only a history of Middle Eastern immigrants to Mexico but a history of modern Mexico. The revolutions, elections, and nation-building events of Mexico are all incorporated ... So Far from Allah, So Close to Mexico pieces together the history of Mexico with the lives and dreams of immigrants who traveled halfway around the world to start new lives or have opportunities that were not available to them elsewhere." 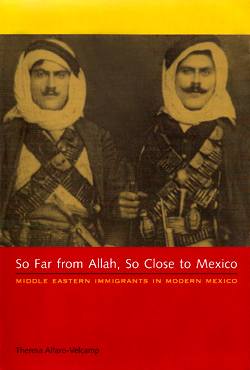 "Shifting the study of identity politics from language to cultural economy, Alfaro-Velcamp’s So Far from Allah, So Close to Mexico serves as an insightful and concise examination of the ways that difference and belonging were negotiated by Middle Eastern immigrants and descendants in the Mexican nation from the late 19th to the mid-20th centuries. ... She demonstrates how the Lebanese sought to become “the hegemonic voice for all those of Middle East descent in Mexico” and the ways that Middle Easterners were popularly stereotyped as foreigners with an innate commercial acumen that could either increase or threaten the nation’s wealth. ... Alfaro-Velcamp persuasively demonstrates that mexicanidad not only involves homogenization but also denotes pluralism." "[Y]our chances that the sangre of the Levant courses through your veins is more likely than gabachos may think. ... I recommend you buy Theresa Alfaro-Velcamp’s excellent 2007 study, So Far from Allah, So Close to Mexico: Middle Eastern Immigrants in Modern Mexico, in which she examined thousands of genealogical records of Lebanese and Syrians who moved to Mexico." "This is field-altering scholarship... This work is a valuable contribution to the growing number of works that link these two world areas not usually studied together and that strive to deepen our understanding of a world order too-often reduced to facile categorizations such as East/West or the developed world versus the developing world. ... Alfaro-Velcamp highlights the human drama that international migration represents. So Far from Allah most ably chronicles one community’s struggle to become part of a new nation while also maintaining loyalties to distant lands." "In her insightful analysis of the emergence and transformation of Middle Eastern identities within official and vernacular discourses on culture, Alfaro-Velcamp also opens up lines of inquiry that can greatly enrich a literature on the cultural politics of Mexico and other “mestizo” societies in Latin America. The author’s notion of “foreign citizens” captures nicely the unique place of immigrant elites in the social and ethnic landscape of Mexico as a mestizo nation. ... So Far from Allah invites us to think about how this particular brand of Mexican multiculturalism has excluded the experience of populations that arrived in national soil in the late-19th century, and whose identities are not bound to any single aboriginal homeland within the borders of the republic."